Iran’s foreign minister cancels a dinner meeting with the EU’s foreign policy chief in protest of her meeting with opposition activists. Iran’s foreign minister cancelled a planned dinner meeting with the European Union’s foreign policy chief on Monday over meetings she held with opposition activists during a visit to Iran earlier this month, The Associated Press (AP) reported, citing the Iranian Fars news agency. 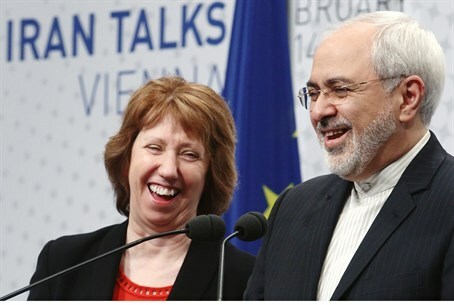 According to the report, said that Foreign Minister Mohammad Javad Zarif’s cancellation of Monday’s scheduled dinner with Catherine Ashton in Vienna was intended to protest “uncoordinated meetings in Tehran,” a reference to her meeting with female opposition activists convicted of rioting after the disputed 2009 election. Ashton’s spokesman, Michael Mann, confirmed to AP that there was no dinner but declined to say whether it was cancelled by the Iranians. He would only say that Ashton and Zarif had met recently in Tehran so there was less of a need for them to meet again ahead of Tuesday’s round of nuclear talks between Iran and the West. “The High representative was in Iran last weekend and spent a great deal of time with the minister,” Mann said, according to AP. “There’s therefore less need for a dinner this time… She has preparatory work to do with her team,” he added. Zarif was in the Austrian capital for talks with world powers over the Islamic Republic’s nuclear program. Under a six-month interim deal which was reached in November and went into effect in January, Iran agreed to freeze its uranium enrichment program in return for sanctions relief worth some $6-7 billion, including the transfer of some $4.2 billion in frozen overseas funds. That interim agreement is meant to lead to a final accord that minimizes any potential Iranian nuclear weapons threat in return for a full lifting of sanctions. On Sunday, Zarif said that Iran does not expect to cement a final deal in the coming round of nuclear talks with world powers. "We don't expect to reach a deal in this round of talks. Nor was a deal on the agenda for this round of talks. We have agreed to discuss a number of issues in this round," Zarif said. He added that Tehran and world powers will discuss "dimensions" of Iran's nuclear activities like uranium enrichment, a heavy water reactor as well as sanctions in the Tuesday and Wednesday talks in Vienna.